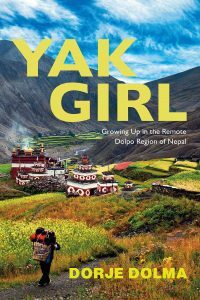 This unusual memoir immerses us in the fascinating story of a spirited girl in a remote, undeveloped region of Nepal near the border of Tibet, a place made known to the world in Peter Matthiesen’s The Snow Leopard. Life above 13,000 feet in Upper Dolpo—often called the last paradise because of its breathtaking snow-capped peaks, untouched beauty, and hand-irrigated green pastures—was one of constant risk and harsh survival. Dorje’s life centered around the care of her numerous younger brothers and sisters and the family’s sheep, goats, and yaks. At age five she began herding and was soon taking the animals high in the mountains, where she fought off predatory wolves and snow leopards. Covering her first ten years, the story takes Dorje from her primitive mountain village to the bewildering city of Kathmandu, and finally to a new home in America, where she receives life-saving surgery. With humor, soul, and insightful detail, the author gives us vividly told vignettes of daily life and the practice of centuries-old Tibetan traditions. This wonderful and surprising tale of survival, loss, and self-reflection offers us entry to this difficult, yet magical, place. Dorje Dolma was born in the remote Dolpo region of Nepal, high in the mountains bordering Tibet. To find help for a life-threatening health condition, her parents took her at age ten on a month-long trek to Kathmandu, where they encountered westerners who brought Dorje to the United States for the surgery that saved her life. Dorje graduated from the University of Colorado with a degree in Fine Arts, worked as a pre-school teacher, and continues to develop her art. Book Network, 800-462-6420 and other book distributors.